The Limestone City Juggling Festival is proud to present our Gala Show, featuring amazing performances for the whole family. Tickets are available at the festival or at the door – $15 for adults, $10 for students, and $5 for children twelve and under. If you’d like tickets in advance, send us email. 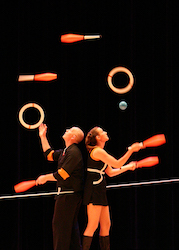 We’re very excited to welcome this year’s special guests, the Institute of Jugglology! Ellen Winters and Galen Harp juggle to get out what’s inside. In 2005 they combined forces and established the Institute of Jugglology to craft new juggling that makes the world smile. Using juggling props instead of brushes, they create a surreal ephemeral painting during every performance. In 2014 they were awarded the gold medal at the International Juggling Championships for their routine “Mandala”, which they’ll be performing along with several other amazing pieces! Morgan is the president of the Queen’s Jugglers’ Club and a fourth year drama student at Queen’s University. When she’s not juggling, you can find her leading tours at the Haunted Walk of Kingston or writing about theatre she has seen on her blog. She loves looking silly and can’t wait to prove it to you at the Limestone City Juggling Festival Gala Show! Sam is a juggler out of Ithaca, NY who has recently wanted to bring the past to the present. In our show he is delighted to bring you his version of Cinquevalli’s Human Billiard Table, a rare and classic routine from the time of Queen Victoria. He trains at Circus Culture and is excited to be performing. This year’s winner of the X-Juggling 3-ball extreme competition, Kevin is truly a ball juggler’s ball juggler. When not throwing things he keeps busy making deals, designing molecules, and doing science education as part of a cutting-edge synthetic biology startup in Montréal. A former president of the Queen’s Jugglers, he’s happy to be back on his home turf and sharing his love of spheres with you. From Kingston, Ontario, Jordan is one of our own. Still in high school, he’s already a seasoned performer after making his debut in the Kingston Busker’s Rendezvous and at the first annual Limestone City Juggling Festival last year. We wish Jordan all the best as he auditions in November for a spot at the prestigious École nationale de cirque in Montréal. Ryan is the enigmatic quiet one, until he picks up a guitar. Recently returned from a year studying in South Korea, this Queen’s University student is ready to make you smile and dance in your seat with a juggling-themed musical performance. 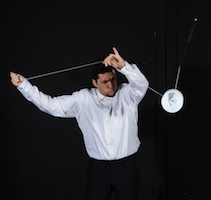 Avery is an alumnus of the Rochester Institute of Technology juggling club, and has spent the last four years learning diabolo. He’s been performing on stage now for about 4 minutes, and is apparently the same age as the Kingston Juggling Club. Follow him on Instagram.